using the image slider the pictures are not centered: there is a space at the left. How can be eliminated ? It seems that there were some changes made to the JotForm using designer using Form Cover that I suspect the cause of the issue. 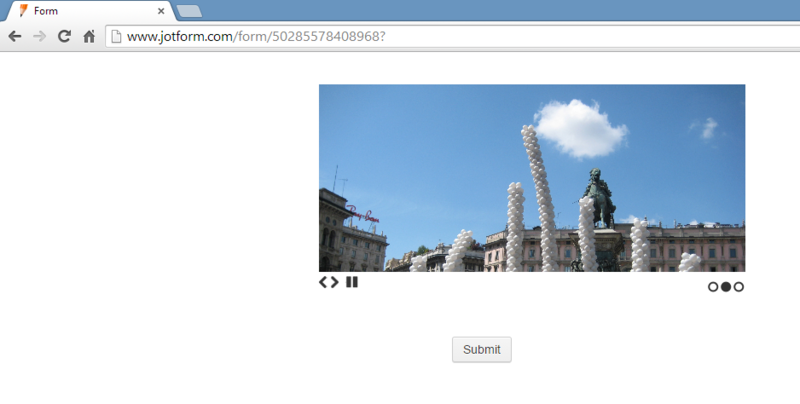 I have tried adding the image slider on a blank form and it is displayed in the center of the form by default. Please see the screenshot below on a maximized screen. Did it change after making any changes to your JotForm? Could you try adding the image slider to a new blank JotForm and get back to us if the issue still persists. Thank you!